who know anything about 9-man football? There is a chance some of the smaller schools in our area might have play 9 man. It would help some school keep a team and some field a team, but hurt some of the better school with more than enough kids. I'm in an area where we fly to some of our away games so the travel rosters would go from 22 to 18. I'm trying to get in front of this in case it happens. Does anyone have any video or playbooks they would be willing to share? I know there is a 6 & 8 man section on the board, but 9 man doesn't seem to get any mention here. As far a I know there are only 3 states that have 9-man football North Dakota, South Dakota, and Minnesota. The easy thing about 9-man is offense you can pick up any 11-man playbook and run it n 9-man you just don’t have offensive tackles. And must have 5 on the los. Which is why they adopted 9-man, teams who were on the enrollment bubble between 9 and 11 man every few years would not have to change everything offensively. The most difficult thing about coaching 9-man is defense. You would be hard pressed to find any material on a 9-man defensive scheme. The two players you are missing could be a combination of any two positions. Nine man also follows trends on offense, lots of spread stuff lots of playing in space. Teams with an athletic quarterback put up lots of big numbers. Lots of 3-4 concepts apply in 9- man but you are for sure missing a safety you have to be creative with outside linebackers and just like any defense you have to get lined up properly. If I were to ever coach 9-man again I would look at some 3-3 stack principles. "Remember Bobby, Soccer was invented in Europe so the women would have somthing to do while the men stayed home and did the dishes." I coach 9-man in Minnesota. Offensive schemes in 11-man largely apply to 9-man. We run a power-based scheme with many wing-T principles mixed in. I coordinate our defense. In Minnesota, we play on a narrow field (40 yards wide) & this helps to close the gap between having two less pass defenders. 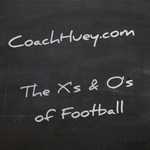 We base out of a 3-4 Cover 2 with 2-read pattern match principles. We have had to adapt some of the reads & footwork to create an OLB/CB position similar to a Cloud CB. We are going to incorporate more 3-3 into our defense & rely on our FS to use Robber principles. I will gladly share anything with you. Where are you located? I coached a couple seasons of 9-man. I agree with what’s above. Offenses mostly convert but defense is kind of a mess, you’re better off working from first principles than trying to adapt something. I don’t think I have any materials left but I can explain our schemes if you want. I was leaning toward going 3-3 on defense from a 4-4. Biggest concern I have is the kicking game. They are not going to reduce the field size here. 9 man football is pretty common in Europe and it's how we've played U19 game in the UK for the last few years (based in clubs rather than schools). We've found that pass pro can be tough with a true drop back passer as edge rusher is coming in hard from that much closer. That said, that is one of the few defensive advantages. We play on a full side field too and all your defensive players need to be good open field tacklers. Coverages tend to be C3, C1 and C0. Don't see a great deal of C2/4. When it comes to the kicking game, I would say that the main difference is you see teams using the pooch kick to minimise the chance of returns as there is a whole lot of open space to cover with two fewer players. Special teams in 9 man are identical to 11 man. Does anyone kick PAT or FG or do they just always go for 2? I've only seem people go for 2 in the little that I have watched. I've tried to find some film and I think I found 2 games on youtube. I'd like to watch a lot more just to get a better feel for the game. Pooch kick on KO also? You'll find many 8 and 9 man teams that don't kick field goals or PATs at all. Converting on 4th and short is much easier in 8-9 man than 11-man given the amount of green grass you have to work with. The same goes for two point plays: picking up those couple of yards isn't difficult in a well run offense. We scrapped our kicking game completely and had high conversion rates on 4th and short in the red zone and on two point plays. A pooch kick on KO can be dangerous in 8 and 9 man as you have to remember there's a ton of grass for people to run to. Those players in the second row may not be burners but they will scoop up the ball and gain big yards because your kick off team doesn't have time to set up. We preferred to boot it deep and allow the kick-off team to get down there and make a play. We spent a lot of time special teams as it's easy to give up or make big plays. We’ve had to play 9-man football on JV either because of lack of numbers on our’s or opponents team. We liked 9 man better than 8 man because of what has already been said. We could pretty much play our offense just with two less linemen. Sometimes we played on skinnier fields - some time not. On a regulation a fast kid can dominate! Coach, what were your best plays for those situations? What were you trying to exploit? Honestly, we just ran our base offense (hybrid Wing-T). People forget that the edges are shorter in 8 and 9 man (even with the shorter field) and you can still attack the perimeter, even on the goal line. You're not stuck running between the tackles/ends on the goal line: we converted many 2-point plays running toss or Waggle Keep.